Wild Plums make the most amazing jam. I picked mine from an abandoned orchard behind the Wheatsheaf Pub in Leybourne/West Malling (ME19 5AT). It's worth a visit as there are loads of apple and plum trees with the fruit just going to waste. I think these are Mirabelles - though some pictures show Mirabelles as Yellow. Whatever they are, they're delicious - and they make great Wild Plum Gin too! Wash and weigh the fruit, removing any stalks, leaves or bruised fruit. I leave the stones in and remove them during the cooking process - but you could take them out before if you like. This picture shows 4lb plums. Add about 1 pint water and bring to the boil, simmering slowly until the fruit is soft but not mushy. As the plums get warm and slightly softer I remove the stones at this point - just with my bare hands, squashing the fruit and taking out the stone - but you could do it later if you like. It's a pain in the neck but also therapeutic at the same time! Once the fruit is soft add 1lb of granulated sugar for every 1lb of fruit (so I used 4lb sugar) and heat slowly to dissolve the sugar. If you boil it before the sugar disolves it will crystalise. My Granny used to heat up bags of sugar in the oven to avoid this happening but I just leave it on a very gentle heat, stiring from time to time, until all the sugar has dissolved. Then, bring it to the boil and heat rapidly (it should be furiously bubbling) for about 10 mins or until setting point is reached (104c). I have tried various methods to determine this, including a jam thermometer, but the best one is my Mum's trick of holding the wooden spoon up high above the jam. If the juice just runs off it's not ready yet, but if it forms a slow drop that looks sryupy then it's done. Very technical! I think slightly runny jam is better than a solid brick so don't boil it too long. Pour into sterilised jars, seal and label. Perfect! This is not an authentic curry from any particular region. It's a store cupboard and fridge curry that you can rustle up after work in the time it takes to cook the rice. I make it quite mild as Hannah is more 'Korma' than 'Vindaloo' - but you can add more spice to taste! Peel and chop 1 large or 2 small onions. Sweat with some vegetable oil in a large-ish saute pan (or wok). Add equal quantities of chopped fresh ginger and garlic, or just spoon some garlic ginger paste from a jar (I keep one in my fridge). Add 1-2 tbsp of curry paste or curry powder (I used Madras curry powder as I didn't have any paste open). Technically this is a South-Asian-ish curry so Indian curry paste would be good but I often use Thai and get away with it. The point is that this is everyday curry - so it's made with what you have in the cupboards and the fridge so you don't have to go shopping. Roughly chop some veg, whatever you have in the fridge, to bulk up the curry, add goodness and niceness. Tonight I used 3 carrots, 1/2 a small butternut squash and some green and yellow peppers. I have added potatoes before - especially good if it's a veggie curry. Green beans and frozen peas work well too, but add them later on so they don't get overcooked. Pour in 1 tin of coconut milk, fill the empty tin with water and add that too. Add a tbsp of tomato puree, or a large squeeze of tomato ketchup. Trust me, it works. Season to taste. Add some protein here if you're using it - chunks of skinless, boneless chicken thighs are our favourite, but breasts are OK. Turkey chunks is good. Fish works - tonight we had frozen coley fillets (el cheapo) dropped in whole from frozen and just flaked through at the end (salmon too, but I prefer that in parcels). Simmer everything until the veg and the meat/fish is cooked, and serve with steamed basmati rice (or value long grain) and chopped coriander. Mango chutney is essential. Well, it's my favourite time of year for foraging. It's all begging to be picked, and I don't have enough time to gather what I need. Small handfuls of blackberries have fortified my morning dog-walks for the past month - with the occasional doggy bag (literally!) full of berries brought home when I couldn't resist it. But I have had a couple of serious foraging mornings, one in the quarry and one in Leybourne Woods that have yielded huge bags of apples and mirbelle plums, some bullaces, blackberries and rosehips. I just love these 'me-times', soaking in the peace in the woods and countryside and thinking about the happy hours I will spend pottering in the kitchen putting them to good use. I was also given 3 tubs of Damsons by my neighbours - and various friends and neighbours have left empty jars on my doorstep over the past few months. People are kind - and they always get a full jar in return! Produce so far has included Damson Jam, Hedgerow Jam and Pickled Plums. 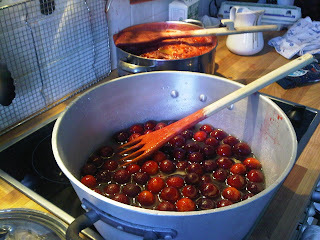 There was wild cherry and apple jam earlier in the season. Lots of Blackberry Cakes too. Preheat oven to 180c and grease and line a small traybake tin. Pour into the prepared tin. Scatter over 2 generous handfuls of blackberries and 1 large Bramely Apple, peeled, cored and sliced. Rub together 2oz plain flour and 1 oz softened butter or margerine. Add 1 oz caster sugar. Add this crumble mixture to the cake, on top of the fruit. Sprinkle with demerera sugar and bake for approx 40 mins or until a skewer inserted comes out clean. Cool for a while in the tin. Have some friends over, make a big pot of coffee or tea and eat the cake whilst slightly warm - with cream if you are feeling naughty.